We've been working on a project to make two raised planting beds for growing vegetables. It has taken a couple of weeks so far. The goal this weekend was to try to get both the beds into the ground and filled with soil. Well we got one finished. It turns out that when there are a lot of roots and rocks in the ground it can take a while to dig. 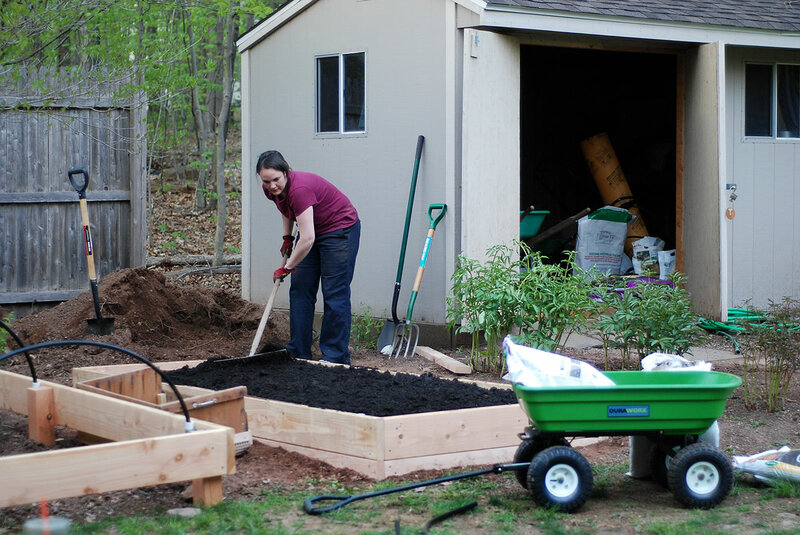 Once the hole was dug we leveled out the bed and filled the soil back in around it. 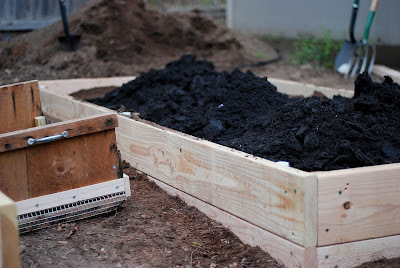 With the use of an old box that was in our basement and some wire mesh we made a garden sieve and used it to screen the rest of the soil to get rid of all the roots and rocks. It looked pretty good but we bought some bags of soil just to be sure. A few bags of quality soil and manure later and we now have a good looking start of a vegetable garden. Of course we'll need to actually plant some to really see if it works. Looks like your beautifully manicured raised beds will put mine to shame soon. You'll soon see the fruits of your labour. The raised beds look great! What are the 3 arcing rods for? Looking forward to cookouts with fresh veggies in Cheshire and JP this summer! Erin, the rods are to support netting to keep out the critters. 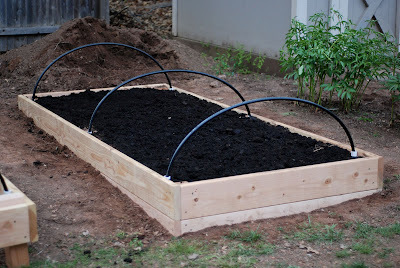 Also you can drape a frost blanket over the rods that allows you to start planting a little earlier and keep going a little later in the season without your plants all dying off.